Beautiful and chic, this end table is ideal for any home. 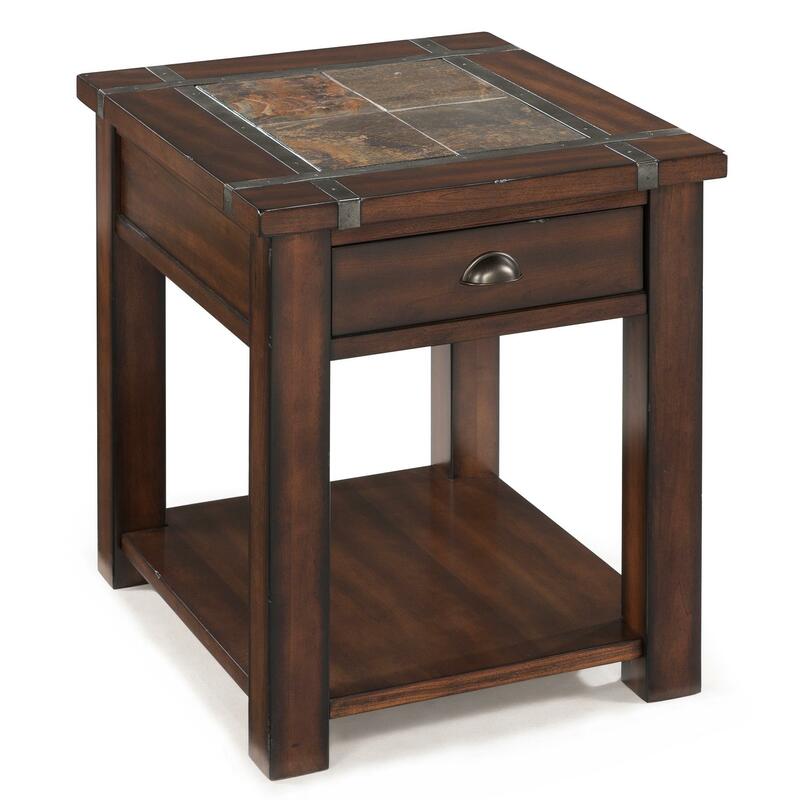 With its exquisite detailed patterned stone top and handy drawer, this end table is the perfect blend of style and storage for your living room. Also equipped with a shelf on the bottom, this end table has ample room for holding your drinks and magazines. The Roanoke Rectangular End Table With Drawer and Shelf by Magnussen Home at Sam Levitz Furniture in the Tucson, Oro Valley, Marana, Vail, and Green Valley, AZ area. Product availability may vary. Contact us for the most current availability on this product. The Roanoke collection of occasional tables adds an earthy, sophisticated touch to any home. 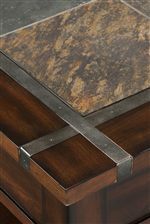 Patterned stone insets on each table top and are sure to impress while the metal border completes the piece for a polished look. The cocktail table not only has casters, but is also a lift top, for a handy mix of modernity and class. The other tables all have shelves for your magazines and a few have drawers for your TV remotes. The Roanoke collection adds class and style to any home and is a perfect addition to yours. The Roanoke collection is a great option if you are looking for Mission furniture in the Tucson, Oro Valley, Marana, Vail, and Green Valley, AZ area. Browse other items in the Roanoke collection from Sam Levitz Furniture in the Tucson, Oro Valley, Marana, Vail, and Green Valley, AZ area.